Figures 2c-d: At 8× magnification the Bioclear Diastema Closure Matrix can be truly appreciated as the gingival apron is inserted gently and deeply into the sulcus. Magnification, Advanced Magnification, Extreme Magnification. What does that mean to a general dentist? To help explain lets explore the parallel continuum of magnification and computer processing power. However, because powers of magnification have a squared, not linear relationship to visual information, a seemingly small jump in magnification creates a level of visual information that will profoundly impact the potential for clinical accuracy (Figs. 1). Early on, during the advances in the power of computer processing, a prediction was made that every 18 months a ten-fold speed increase would warrant an upgrade in the processing chip. And sure enough we all kept upgrading our computers from 286 to 386 to 486 to the Pentium to the dual processor, etc. Ten-fold power change is key for computer speed as well as visual information. 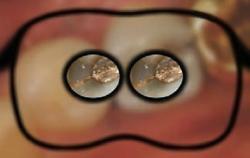 The general consensus is that at 3.5× magnification it’s not just better dentistry, its different dentistry. Then at 10× it happens again. In other words, at 3.5× you can do things that you simply cannot predictably perform without advanced magnification. 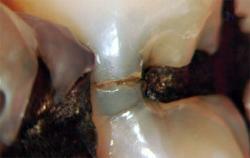 See example in the diastema closure/peg lateral series (Fig. 2). 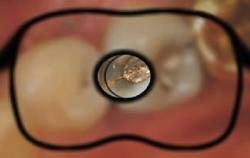 At 10× (extreme magnification) another world opens up that is demonstrated in the endodontic images (Figs. 3, 4). Microscopes allow the clinician to see and create new possibilities. The case featured in Fig. 2 is a perfect example. The concept of staged wedging was invented under the microscope. In this example, the patented Bioclear Diastema Closure Matrix is selfwedging and the first increment of flowable composite is placed and cured without a traditional wedge. Once the «hip» or undercut is established, heavy wedging pressure is applied before the contact portion of the composite is placed and cured. The six-week extreme magnification photograph shows a perfectly pink and perfectly stippled new papilla that has grown into the microscopically smooth and round embrasure. 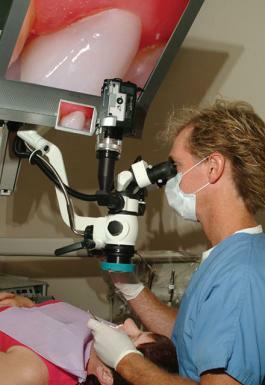 While a microscope (10×) magnification is not required to perform the procedure, it was microscopic analysis that inspired the technique and the more clinical magnification used, the greater the ease and enjoyment of the procedure. In the Fig. 5 mural, everyday diagnosis is challenged by advanced and extreme magnification. As one of the first clinicians in dentistry to document cracks with a clinical microscope, I published the first guide to dentinal and enamel cracks1 based on 16× magnification. I recommend that everyone read the guidelines – some of which might surprise you (www.bioclearmatrix.com). The naysayer’s point is «Who cares about predicting dentinal cracks? Magnification is for the lab, not the clinic.» The answer to that is patient retention, fee collection and scheduling issues. For example in the case of Fig. 5, I diagnosed pathological cracks in the enamel, but scheduled the appropriate time for a direct intracoronal restoration knowing that the tooth was not cracked (No dentinal crack = tooth is not cracked). If I had misdiagnosed the case and discovered a dentinal crack upon removal of the amalgam, I would have had to «back my way» into collecting a much higher fee for an extra-coronal (crown or onlay) procedure not to mention the aggravation to the staff when the procedure runs overtime. Clinical Microscopes; Luxury or Necessity? 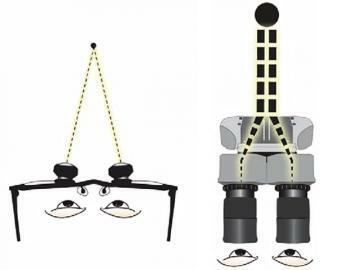 The operating microscope is not just simply higher magnification than oculars (loupes). It is better magnification. Oculars have been very helpful and may always have a role in dentistry, but the optics are crude when compared to the Infinity Corrected Optics of a stereoscopic microscope (Figs. 6-9). When combined with the shadowless coaxial light source, they transform the clinician’s potential for accuracy of nearly every aspect in the different disciplines in dentistry. Increasing levels of magnification produce a squared, not linear relationship to visual acuity. In other words, a clinician working at 3.5× sees over 10 times more visual information. 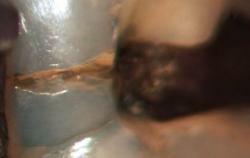 10× magnification allows the human retina to acquire 100 times more information. 20× allows 400 times the visual information (Table 2, below). 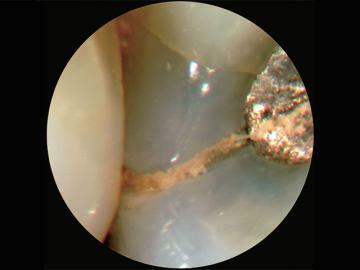 Tactile Endo vs. Micro-Endodontics; Do We Have Two Standards of Care? In Fig. 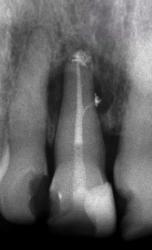 7, we see a huge lateral system that could have easily been missed with traditional tactile (blind) endodontics. The crazy thing about endo is that if this had been a vital case (no lesion) I might have gotten away with missing that lateral system. 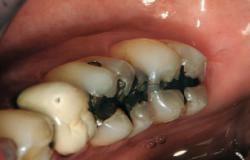 In fact in a vital case you can often get away with 4mm underfills or even missed canals. I have personally disassembled several cases where the dentist shaped canal systems and somehow forgot to insert the gutta percha into one of the canals and yet the case was succeeding years later. Invariably, these crude yet successful cases were infection free at the obturation appointment. In contrast, for the lesion case like the one featured in Fig. 3, you can’t be too good. And the research shows that your success rate will be significantly higher if you allow a six-week to three-month calcium hydroxide therapy in infected cases2. 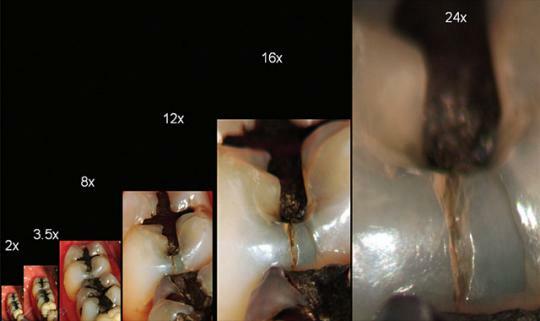 A first rate Ca(OH)2 therapy in a lesion case combined with finding all of the canal systems under the microscope is «top shelf» treatment. Unless you only treat vital cases and simple cases; without a microscope, you are a second-class citizen. That said, there are other factors that you will need to address if you want to get to a 98 percent success rate that should be the goal of a general dentist or 93 percent specialist success, which Dr. John Khademi (my co-author and endodontist extraordinaire) shoots for based from analysis of his TDO database (Endodontists treat more complex cases than we should be treating, hence the 98 versus 93). The final word in endo: Poor, even terrible endo succeeds far too often (almost exclusively in non lesion cases). «Excellent» endo performed under the microscope sometimes fails, often because it was an infected [lesion] case treated in one appointment. Regardless, microscopes are the single most important tool in the pursuit of zero defect endodontics. How do you integrate the microscope? Once you take the plunge to a clinical microscope, how do you integrate it into your routine? Where can you find training? What about patient education and documentation? I will provide a brief outline of how it can work best for you. Step six : Attend a microscope «boot camp» like the two-day course at NCOFI in Newport Beach, California. Step one is the microscope course. I do dozens of courses every year for endodontics and Bioclear composite techniques using microscopes. The dentists are having such a good time learning the techniques that they forget that they are even using a microscope. By the end of the day they are either «hooked» or they have given up and put on their loupes. These tend to be the best way to become comfortable with a microscope without actually committing. Step three, the one-procedure-at-a-time training, is an interesting approach. Learning to use a clinical microscope is a bit like eating an elephant. Instead of running around the elephant biting off little bites in a haphazard way, sit down and eat the trunk. When that’s gone eat the left ear, and so on. What are the best, most productive and easiest procedures to start with using a microscope? Examples include a Class V on a central incisor, occlusal composites or any procedure that allows you to work on one surface for an extended period, like endo. 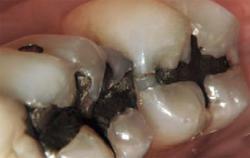 Cutting a quadrant of crowns or posterior composites needs to wait until you are further along in your progress. Some dentists like Glenn van As jump right in and incorporate the microscope all at once. His approach is discussed below. Most dentists, however, will follow the gradual method mentioned above. Step five is the breakthrough commitment. It is the key to the creation of a microscope centered practice. The single most important element in realizing significant ROI and to create a microscope centered practice is to allow patient and staff to see the incredible view that the doctor sees. A live and recorded video broadcast is the first step to bring about these fundamental changes. Trust, cost versus value, and patient loyalty are but a few of the principles that are deeply impacted. Make sure that you have a video camera installed when you purchase your microscope. An inexpensive television or LCD screen is placed in patient’s view and should always be turned on (Fig. 1). The key to the creation of a microscope centered practice is video taping the tooth and soft tissue portion of the comprehensive exam. We present the video later as part of the comprehensive treatment consult. This simple process requires almost no technical learning curve and no interruption of your clinical routine. It will literally transform your practice by revolutionizing the most important appointment; the new patient experience. Just as importantly, you are teaching yourself to visualize every surface of every tooth through the microscope in a low stress (non operative) environment. • Micro pathology – This new term describes important pathology that is either invisible or not compelling at less than 12×. This includes signs of occlusal disease (tell tale facets and enamel loss), early incomplete fractures, micro leakage, early recurrent decay, and isolated periodontal inflammation surrounding crude dentistry that has a violation of the three new parameters of marginal integrity. • Dramatic Results – Patient motivation is, in a word, incredible. • Productivity – The average adult older than 30 presents with two posterior teeth with fairly dramatic early Incomplete Coronal Fracture that their last dentist never saw. Many of these teeth have a history of symptoms. In the average practice it will take several years of several procedures per week to treat these teeth. Glenn van As, BSc, DMD, was not the first restorative dentist to use a microscope, but was definitely one of the first to use the microscope for pretty much everything, and nearly all of the time. He inspired me to transition from a «loupes first, microscope second» to a «microscope first, loupes second» routine for my clinical day. Glenn was practicing under the burden of the Canadian fee system where the College of Dental Surgeons of British Columbia sets a fee schedule. That fee schedule is about 40 percent lower than my fees in Tacoma, Washington. Although he had a much higher volume practice (because of lower fees) he beat me to the punch to adopt the microscope as the center of his clinical day. I told myself, «If Glenn can do it, then so can I» and in 6 months it came to fruition. Never underestimate the power of inspiration. Early crack diagnosis occurs at 16×. Anything less is a guess or end stage diagnosis1 (End stage referring to loss of pulp or fracture causing loss of cusp or fracture requiring subsequent extraction). Dentistry is way more complex and way more iatrogenic than I thought before. 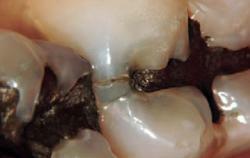 Tooth colored restorations require far more magnification than metal restorations. Rounded cervical profiles in porcelain and composite can create great health and great aesthetics but magnification is required to pull it off and not leave an overhang. 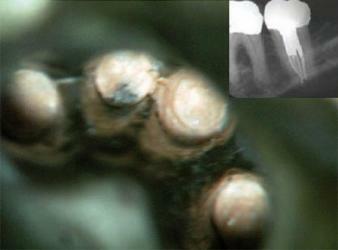 Without a microscope, you might become a second-class endodontic clinician. I sleep far better at night knowing «I truly gave it my all today». Sjogren U, Figdor D, Persson S, Sundqvist G. Influence of infection at the time of root filling on the outcome of endodontic treatment of teeth with apical periodontitis. Int Endod J. 1997 Sep;30(5):297-306. Erratum in: Int Endod J 1998 Mar;31(2):148. De Boever JA, De Boever AL, De Vree HM. Periodontal Aspects of cementation: materials, techniques and their biologic reactions. Rev Belge Med Dent. 1998;53(4):181-92.